Passover and the Democratic Convention, are and were two events that have kind of defined my life. Maybe defined is not quite accurate. But there is not really another way to describe them except maybe to say momentous. So substitute momentous for defined. In 1980, and just because no one could believe I would do it, Bill Dixon asked me if i would consider being the Director of Security for the Democratic Convention at Madison Square Garden. It sounded like a fascinating way to spend what would be the end of the Carter Administration. Additionally, being in New York in that position would open doors that would have remained closed to any woman in that era. Having taken political jobs throughout my political career that were traditionally male was something I had done before but certainly not on that scale. 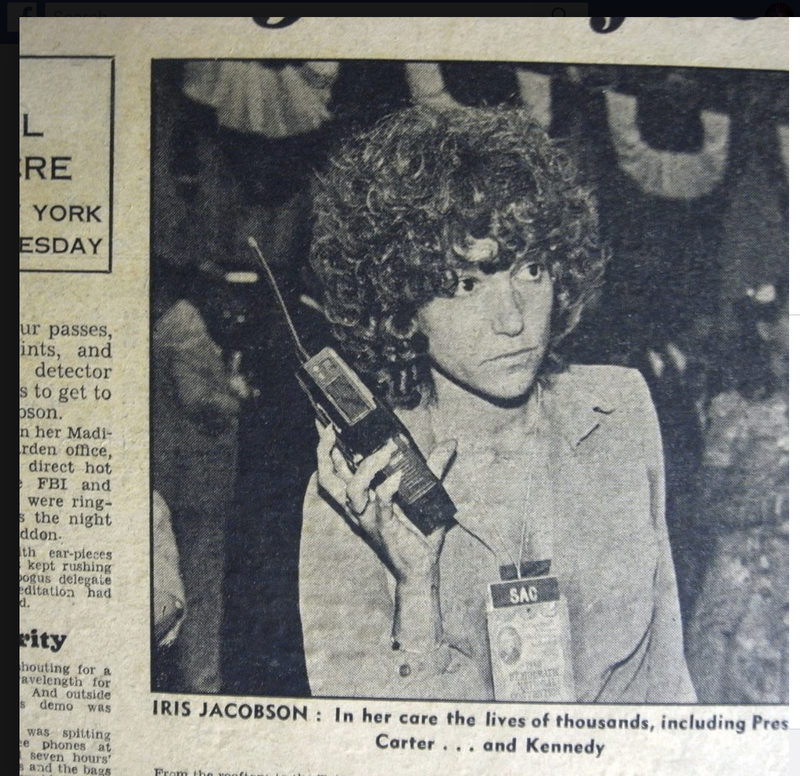 It took, as Paul Dacre wrote in the Daily Mail, “it took four check points, 11 passes and two metal detectors to get to Iris Jacobson.” Friends have described that time “as harder to get to me than to the mayor.” The giant phones/radios connected me to Madison Square Garden Security the Secret Service, the FBI and NYPD and could we have all been on one channel? Probably, but but no one wanted to share information. As was described in the Dacre piece, I was “spitting orders to anyone in the area who was not paying apt attention to what needed to be done.” What a hoot. Me and 28,000 men — good odds right? At that time there were no women security personnel assigned to the convention. Before we built the Garden, (once the Ringing Circus left, and we got the smell under control), we were Headquartered in the hotel across the street. The office was so small we had to credential VIP’s in the bathtub, which made Chris Matthews, Tip O’Neill’s aide, none too happy. As I recall, until Tip said it was fine to climb into the bathtub, Chris yelled and screamed about how that was not going to happen, It did. How I wish we had video of that encounter, but it wasn’t yet available in those days. Which brings us to the next impactful subject in my life, Passover. In my traditional Jewish family we gathered on Fridays for dinner at Aunt Sophie’s, and sometimes Sunday to listen to Jewish music and dance —at aunt Sophie’s. The family was divided geographically into two places, Boonton N.J. and Newburgh N.Y. Year. The one time we all gathered was Passover. From the time we were small the highlight of our Passover was finding the Afikoman and getting in line for the silver dollars we received as payment. Each uncle would give us ten or more silver dollars and at the end of the line was Bubbie who took at least 10% of the money for charity, or tzedakah. We didn’t really understand because we considered ourselves our own charity. But Zaide explained in broken English that in the shtetals the Rabbi went house to house on the Sabbath with the tzedakah box, and if you had the money you put it in the box, and if you didn’t, you took what you needed. No one knew who put in and who took out. That was a life lesson that was unforgettable, and probably the basis of my life in public service. But beyond that it seemed important events happened at Passover. It was a time when all my friends, Jewish or not, gathered at my house for Seder. It was also the time when David came to my house and stayed in my life. Passover was the time that our mothers passed the traditions and recipes from their generation to ours. When they prepared for Passover it took six weeks. When we were in charge of the preparation it took two days. What we realized was that they wanted to spend six weeks together arguing, cooking, and playing cards. 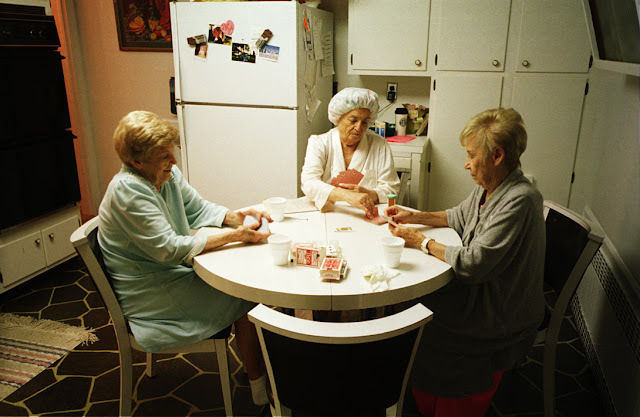 Along with our family documentary, “The Gefilte Fish Chronicles”, David also took a picture of the aunts playing cards, which was published in the “NYTimes Magazine’. Special unforgettable memories were made and life lessons were learned around Passover. It was the time we realized that the power of tradition and family was not unique to us. We were merely an example of the universal family. We could have been Italian, Black, Asian, Polish, or even families without ethnicity. It’s about, as I said, the power of family.